Hawkins recently sponsored a Masquerade Ball fundraising event on 3 March 2019 held by the Moor House School & College in Oxted, Surrey. Dr Simon Vallance attended with his wife, Jane Vallance, who is a Senior Teaching Assistant at the school. The Moor House School & College is a specialist school that provides teaching, therapy and residential care for students aged 7 to 19 with speech and language difficulties. Sarah Wellington, accounts assistant at Hawkins’ Cambridge office, has recently taken the Great Row Challenge for Cancer Research, which is the UK’s biggest indoor rowing fundraising event. During February Sarah rowed the distance of a marathon on a rowing machine, and had previously walked 12 miles for MacMillan Cancer Support. She is already thinking about fundraising in future for the children’s ward at Hinchingbrooke Hospital, where her son was recently cared for during a week’s stay. Sarah was also extremely close to her grandmother, who died of cancer when Sarah was only 15, and so this cause means a lot to her. 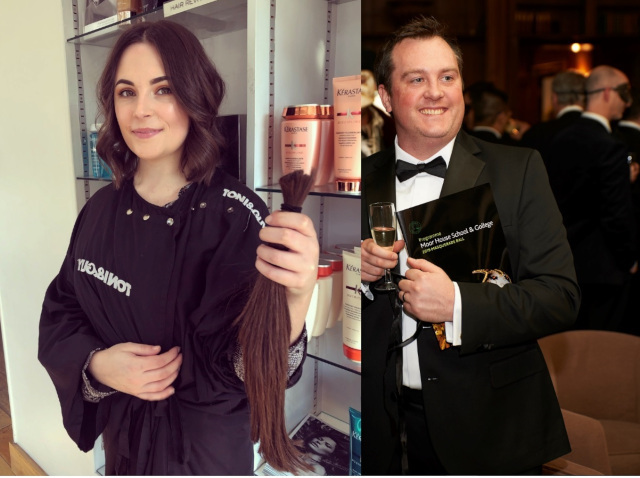 Emily Verney, receptionist at the Cambridge office, has recently cut her hair to donate it to the Little Princesses Trust. This organisation provides wigs, free of charge, to children and young women who have lost their hair due to either cancer treatment or other medical conditions. Their wigs are made possible because of donors like Emily. She has also participated in the Race for Life before, and says that after her hair grows back, she’d definitely donate it again. Jo Sears, secretary at the Cambridge Office, is in the middle of her effort to Walk All Over Cancer, in a quest to take 10,000 steps per day, every day in the month of March. She’s made the commitment on her own, though says she has been roping people in to take walks with her along the way. She finds that having a puppy has definitely helped her get all the way to 10,000 each day! Jo has previously done the Race for Life, as well as a 10k run for the local hospital, where her children were born, to raise money for the Special Care Baby Unit. She’ll be doing Race for Life again this year after completing her 310,000 total steps. Supporting Cancer Research UK has been a special cause to Jo, and the loss of Hawkins’ colleague Karen Holmes has inspired her to make a difference. Lastly, both Helen Child and Helen Smith, Office Manager and Secretary at the Reigate Office, recently registered to take part in the Banham Marsden March. Unfortunately, the event was cancelled this year due to wind and rain. The Marsden March is usually an annual 15 mile walk, which finishes at The Royal Marsden hospital in Sutton, for the Royal Marsden Cancer Charity. Helen and Helen have, however, still donated to help this charity make a difference, and have also done several of their own practice walks. They will definitely be participating next year, if the weather in Surrey ends up being more charitable. Hawkins extends our congratulations and thanks to everyone who is able to participate in an activity to benefit a charity in 2019.